Episode 13 airs at 11:30am ET / 8:30am PT! 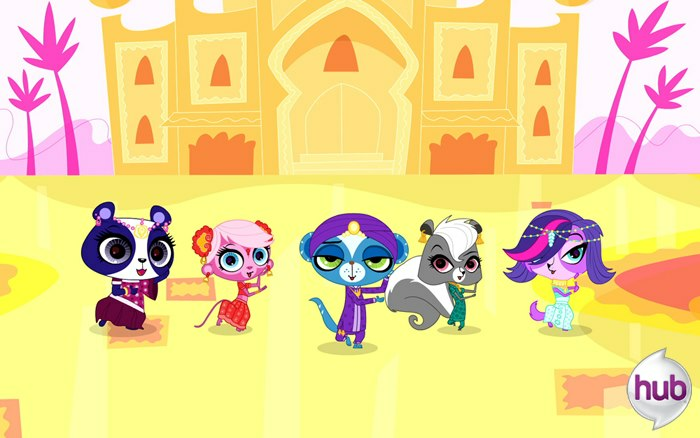 For you bronies, last week's episode of LPS, "So You Skink You Can Dance", will air between the new "My Little Pony" episode at 10:30am ET / 7:30am PT and Episode 13 of LPS. Also for you bronies, BOTH livestreams below will be airing BOTH new episodes of MLP and LPS from 10:30am - 12 noon ET / 7:30am - 9:00am PT! How convenient! If you have a YouTube video link, please send it to us (ThePetShopInsider@live.com)! Do NOT post it in the comments below! Comments with the YouTube link will be deleted. And don't forget this is also a discussion board, so go ahead and discuss in the comments below! Got conspiracies, questions, hopes, reactions? Post them in the comments below! That was awesome. I was laughing throughout the whole episode. And the song was amazing. Not only was it catchy as heck (with some gorgeous vocalizations in chorus), but it was delightfully satirical. While Shahrukh is bragging about how awesome life as a movie star is, his expressions and some of his lines show that it really isn't ("I think that's funny but don't ask me/I pay other people to laugh at me" is one of the most depressing lines I've heard in a song from a cartoon). And it had a lot of bellydancing in it, which is a dance form I adore. Here I'm being a bit cynical, but who wants to bet some parent is going to call Hasboro and try to get this episode banned because of the bellydancing and kissing? No really, there was kissing; watch Shahrukh's movie at the beginning, he's totally making out with the mongoose chick. With the amount of overprotective parents out there, I wouldn't be surprised. On to the mongeese. Shahrukh was delightfully deplorable. He was like King Julien, except somehow MORE spoiled. And I liked his color scheme; it made him stand out, which really helped show that he's a character who needs to be the center of attention. And Sunil was amazing in this episode. He's got mad magic skills, yo; he can teleport. TELEPORT. And make Pepper's eyes dissapear, apparently. Seriously, who would've thought they'd put implied EYE SCREAM in an episode of LITTLEST PET SHOP. That was epic. All in all, today's episode was absolutely amazing. The only thing I wish was that we had gotten a little bit more of character development from Sunil (he was still the same old nervous, cowardly, pessimistic low-self-esteemed mongoose we all know and love), but it's okay. The episode was still entertaining and brilliant without it. I will watch the episode tommorrow I guess. I dislike the different hours around the world but whateva'. Awesome episode, I loved it. well it nice Sunil gets the spotlight, I thought his magic trick at the beginning was pretty good. And the movie at the beginning, throwing darts at the bad guy that is kind of grewsome for a kids cartoon. I liked the song at the beginning, it was great, Daniel is a great composer no doubt. And I don't care what Zoey says, Shahrukh is a much bigger diva than Madam Pom could ever be. Speaking of which, Shahrukh is the first animal to have a conflict with one of or all of the pets and they don't become freinds at the end. Yeah he learned to appreciate his life better, but there is no appoligies or reconcilations or anything like with Esteban, Madam Pom, and Scout. And so far, Tootsie is the only animal has a normal action to finding out Blythe understanding them, all of these animals outside of our regular seven, they act like a human than can understand them is an everyday thing. Speaking of Blythe, great sculpture, and Jasper gets a mention though he doesn't appear in the episode but they didn't forget about him, well I am sure his 2 or 3 fans will be happy about that. I still ship him with Youngming. And we get some Sunil x Penny Ling moments, I am sure the Sunil x Pepper fans will be mad, but so far there has been an episode in which Penny has a had a moment with all the male pets. Penny get around. Though they are trying to push Penny and Zoey as the star pets, so I guess it can't be helped. Anyway I can't believe it, we are half way through the season. Where does the time go? If I was harsh on last week's effort, it's because I;ve said it before - I want to love this show, but it feels held back by some issues. Glad to see that I liked this recent episode more (And I've warmed up to the episode before this one, too, so it's not a big deal to me anymore!). It was a nicely done take on an otherwise (unfortunately) cliche plot and the moral here felt natural in execution and pratice (appreciate what you have, because it can be taken away from you - I applaud this show for not forcing it, as it came natural!). I also applaud this episode for showing us why animal mistreatment in the media is wrong, as I really feel sorry for what Sunil had to, and what Shahrukh does go through to please those using him. So yeah, this only continues the trend of positive things I have to say about this show, if I haven't before. Watched the episode...nice one....but I like how they change Blythe's style each episode....not so lazy. Preview Image of "Trading Places"
SourceThis Source And this. So much these. Possible Title for Episode 14/15? LPS Trading Cards On the Way! Happy New Year from the Pet Shop Insider!